CES 2013 was more of a mobile chipsets show than a devices show. First, it was Nvidia that announced its next-gen processor, the Tegra 4, followed by Qualcomm and its new Snapdragon line. Finally, Samsung also joined the party with its Exynos 5 Octa, but all in all, we're more concerned with the Tegra 4 and Snapdragon 600/800, as those end up used by multiple manufacturers and in multiple phones, whereas Samsung's Exynos is mostly reserved for Samsung's own high-end devices. Nvidia's press-conference offered us a lot more in terms of details about the chipset than Qualcomm's, and we wouldn't be surprised if that means that the Tegra 4 is closer to release than the new Snapdragons. In the past, Nvidia has been better when it comes to major releases of chips, as both the first dual-core and quad-core processors in phones were made by them. We can't know yet if the same is going to happen with this generation, though. As previous Tegra chips, the Tegra 4 will once again be designed for high-end smartphones, and Nvidia is promising that it'll will really push the boundaries, not only in terms of pure performance, but features too. Arguably the most impressive demo that we saw was that of the new HDR photography capabilities made possible thanks to Tegra 4's excessive performance. If most of us "forget" about using HDR when we just want to snap a quick photo, due to the fact that it takes significantly longer to take such a shot, that is soon bound to change, as Nvidia promises that we'll be able to snap HDRs in about 0.2 seconds, which is a pretty decent timing, we have to admit. In fact, the processor is going to be so fast that the user will be seeing a real-time HDR feed from the camera before taking the shot, not a normal view. And since it's very likely that a lot of us will switch to HDR as their default shooting mode once this technology becomes available, it will indeed be quite valuable to see what the image is exactly going to look like before pressing the shutter. The Nvidia Tegra 4 will be a remarkable technological achievement - in addition to the 4 CPU cores, it'll also pack a total of 72 GeForce GPU cores. All of this computational power is going to make features like HDR photography and 4K video recording/playback possible. In terms of numbers, the Tegra 4 promises to pack about 6 times the visual processing power of its predecessor. It is still unclear just how much of a performance boost there's going to be when executing standard tasks like browsing, but if the demos that Nvidia showed us are to be believed, there should be an overall performance boost of at least 2 times. Thankfully, Nvidia has acknowledged the fact that this thing's going to be used in mobile devices, so it hasn't only worked on performance. The Tegra 4 chip is said to bring the quite decent 45% improvement in power management compared to Tegra 3. An equally important news is that Nvidia is finally ready with its i500 Soft Modem, which means that it can now offer phone/tablet manufacturers a full chipset solution, complete with radios. Qualcomm is often preferred as an SoC supplier because its Snapdragon chips feature all the needed connectivity modules, but now Nvidia is doing basically the same, so things are bound to get very interesting. Qualcomm is renewing the way it names its chipsets with its 2013 line-up. No more S4 Pluses and Pros. The new Snapdragons will simply have model numbers ranging from 200 to 800, with the 800 being their top-of-the-line product. The chip maker promises that its Snapdragon 600, which is the direct upgrade point from the current S4 Pro, will deliver an overall system performance boost of about 40% compared to the S4 Pro. While that's fine, the Snapdragon 800 sounds even more exciting. The top offering in Qualcomm's 2013 catalog will sport the new Krait 400 quad-core CPU, which should be able to reach speeds of more than 2.3GHz per core. That should be enough to guarantee a performance boost of about 75% compared to the S4 Pro. A new graphics chip, the Adreno 330, will be taking care of the graphical side of things. Compared to the Adreno 320, which is found in the S4 Pro, the Adreno 330 should be able to double the computational power. Тhe Adreno 330 will also support standards like OpenCL, OpenGL ES 3.0, Renderscript Compute and more, so users who end up rocking a Snapdragon-powered phone in late 2013 won't have to worry about game/app compatibility. Like the Tegra 4, Qualcomm's finest will be powerful enough to support 4K video playback and recording, as well as better (faster) radios for LTE and Wi-Fi. What might have a bigger impact on the sales of these new Snapdragon processors, however, is Qualcomm's decision to invest in advertising its CPUs directly to the consumers. This way, it hopes that the processor will became a bigger factor for the mainstream consumer when choosing a new mobile device. We do think this is a smart choice, although we'll have to wait and see exactly how effective it's going to be. Meanwhile, Nvidia is already quite the name, so it probably doesn't have to worry too much about TV advertising at this point. It's obvious that until we can spend some time with these chipsets and test them properly, we cannot conclude which one is going to perform better. Moreover, the responsiveness of each device will also heavily depend on the software platform and custom UI it uses, so having one powerful processor or another under the hood will not always guarantee the fluidity of the interface. All in all, we should be certain that both flagship chipsets, the Tegra 4 and Snapdragon 800, will be capable enough to power the next-generation of mobile phones and tablets, although we have to admit that Nvidia's proposition seems a tad more exciting at the moment. Not only because of its impressive features like the super-fast HDR shooting, but the fact that it will now be offered as a complete chipset solution as well (with radios and all), which might lead to some quite interesting developments on the mobile CPU market this year. 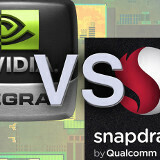 Nvidia's Tegra 4, or Qualcomm's Snapdragon 800 - which one do you think will be the dominant chipset for 2013? I cast my vote to Tegra at this point as I don't know much about S800. But I hope Tegra and Snapdragon will fight each other like Airbus and Boeing. Customers always love such fights of equal opponents. I Vote for the One with better performance. Nope. It's been confirmed multiple times that it will be a Qualcomm chipset. It will be an s4 pro. Ray: I'm not sure how you call unimpressive the Adreno 330... Adreno 225 has 50% better perfomance than Tegra3, and Adreno 320 doubles that, so it's 3 times more performing than Tegra3. If Adreno 330 doubles that again it will have around 6 times the performance of the Tegra3 GPU too. In fact the Exynos Octa will be also be around similar numbers as it aproximately doubles the performance of the PowerVR SGX MP3 of the iPhone 5, which in turn doubles the SGP MP2 of the iPhone 4S wich again is around 50% more powerful than than the Tegra3 GPU. So the race is going to be really tight, I hope to see the first results soon!! Wow, someone makes sense here. I agree totally. Nexus line of phones have always offered better experience than all the poorly crafted heavily specced devices. So, if all statistics are correct; Adreno 330 = Tegra 4 = PowerVR SGX544MP3 Quad Krait 400 > Quad A15 (Qualcomm said it brought 75% CPU increase from S4 quad Krait, which was about 30% sub par of A15) Exynos 5 Octa = 2x Tegra 4 because of same GPU strength yet double the cores with same architecture Exynos 5 Octa = 1.5x Snapdragon 800 since Krait 400 brings about 50% CPU increase from Tegra 4, but still same GPU power Of course there are variations of clock speeds, and the Exynos 5 Octa has double the amount of cores. So when clock speeds remain constant, Exynos 5 Octa > Snapdragon 800 > Tegra 4 Unless my math is wrong, which is a good possibility since it's early in the morning, I shouldn't be doing math. cores dont automatically mean more power than another chip... only more power in that chip's vertical. However, Id be surprised if the Exynos 5 octa isnt the most powerful chip around. Hell, Id be surprised if these chips beat the E5 quad by more than a slim margin. It has, but it's not ready yet. It won't come to the market till the end of this year. The code name is "Bay Trail" (as opposed to "Clover Trail" for the dual cores) and it will feature not only quad core but Out of order CPU architecture in order to equal the performance of the A15 cores. Also it will be built in 22nm not 32nm as the current Atom SoCs are. If done right it may be a big step for Intel in the right direction in the mobile chips. The GPU is still unknown (at least to me).